Razorback Guide Service owns and operates on over 2,700 acres of farmland in Central Virginia. In the shadows of the Blue Ridge Mts. this rolling land provides ideal habitat for whitetail. Much of our land contains planted grainfields, pine and oak stands, cut over and pasture that creates the edges these whitetail love to call home. Razorback Guide Service has a privateland lease that is managed for Trophy Bucks Only. This area is located on rich bottomland planted in corn and other grains. It is the only major food source for several thousand acres. We limit the number of hunters on this lease and permit only mature bucks with racks of 8 points with 16 inch racks or better to be harvested. Hunt from strategically placed stands over looking food sources and travel routes. This area has enclosed tower stands for those nasty days those big boys love to roam. This is a quality hunt and your chances are better than good at a true wall-hanger. Just looking for a legal deer? We have numerous privateland locations for those looking to harvest a legal buck or doe and you still have a good chance at taking a bruiser buck. This is great for inexperienced hunters or father/son hunts. Bow Hunts: Crisp October mornings, mild days and cool evenings. The leaves are just turning and it's a great time to be in the woods. Deer are easily patterned moving to and from food sources. You will hunt from elevated stands 25 yards from trails leading to the feeding areas. The bucks are still bunched up and starting to show their dominance for breeding rights. Scent control is critical to your success. We'll do our part and your success will depend on you doing yours. 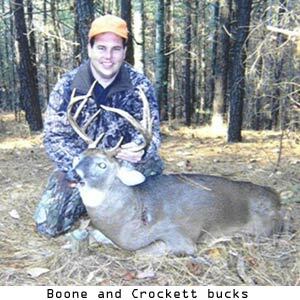 Black-Powder: if you are looking for a true trophy buck, this is the time to be in the woods. Our black-powder season in Virginia falls during the rut and if you are a serious deer hunter, your in the woods. Temperatures are dropping, but the action is heating up. Bucks are fighting and chasing does with only one thing on their minds. Bucks are on the move all day looking for a receptive doe and if you can wait them out, your chances are excellent at taking a quality buck. Rifle: our leases are in counties which allow our hunters to use modern rifles. This can be a busy time in the woods and the deer are getting intense pressure from areas surrounding our leases. We use this pressure to your advantage. By minimizing the number of hunters on our leases, we can hold the deer in that area without bumping them out. Comfortable stands with the increased efficiency of the modern rifle cartridge help you meet up with the big boys. We have many hunters return year after year so book your hunt now!